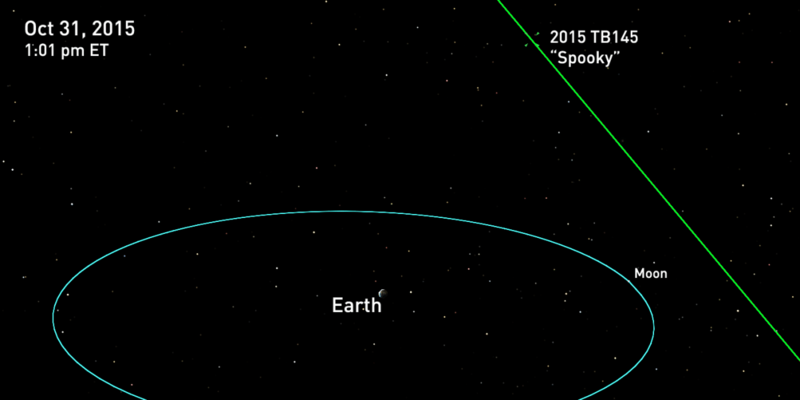 Today the object 2015 TB145 will make a “close” flyby of Earth. It’s been nicknamed Spooky due to its Halloween arrival date, and we’re already starting to learn a few things about it. Spooky was presumed to be an asteroid when it was discovered, but was unusual because of its high relative speed (35 km/s). Its orbit is also unusual, being more inclined away from the plane of the solar system than most asteroids. Its trajectory is more in line with comets, though Spooky has no indication of a coma or tail. But we’re now starting to get infrared data from NASA’s Infrared Telescope Facility (IRTF) in Hawaii and radio observations from Arecibo, which supports the idea that Spooky is a dead comet. In particular, the infrared observations allow us to determine the brightness (albedo) of the comet. It’s albedo is about 0.06, which, though about as dark as asphalt, is actually brighter than most comets. So it is likely an old comet that has lost all its volatiles (surface ice and such) and now looks more asteroid-like than comet-like at first glance. I would like to say thank NASA for what they are doing to look into the stars 4 things unexplainable but also if NASA can look it was the Seas as well might find some wonderful things within this Earth.